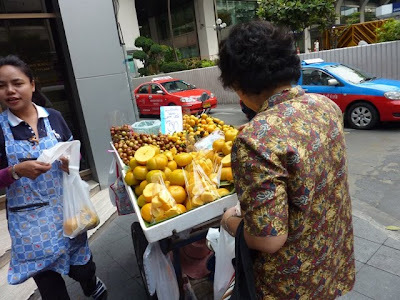 Fruit is soooo delicious in Asia. I made myself a promise to eat lots – they’re so non guilt making and easy to buy on the street, already cut up for you to eat, none of the messy cutting and peeling. This pic shows persimons, oranges (they look like green lemons in Thailand) and another round small fruit I can’t pic. However the most popular combination is red papaya, guava, pinapple and water melon. You can buy them, recently cut and placed in plastic bag, around 10 peices for 10baht or around A$0.30, it’s hard to say no! We bought some papaya and pineapple today, delicious!